L.A.S.T. : ***/¥, Sakuragicho. Mexican, real tasty but not authentic, authentic. 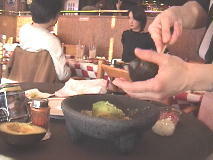 But food was fresh and the waitresses prepared the guacamole and Mexican salad right in front of us. We had Quasadilla, crispy tacos (which by the way is an American invention, not Mexican) dipped in fresh Guacamole, Mexican Salad and soft tacos. This place looked exactly like (I can't believe I forgot the name of the restaurant and Steeles and Woodbine). Anywayz, it looked exactly like it at the entrance! 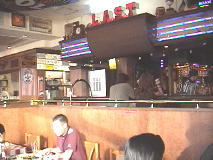 Erawan: ***/¥-Lunch ODaiba. Thai Lunch buffet for ¥1000. I loved the dessert here, it was something different. Jelly in sweet juice with diced lemon slices. I thought it was quite unique. They also had one of my favourites, coconut tapioca. I missed out on one of the curries coz I thought I'd take my time, but when I went to get seconds, they switched it from red curry to green curry! The green curry was watery in my opinion but everything else was really good and definitely worth the sen yen. They even had the boiled sweet eggs that pregnant women eat according to Chinese customs. Ninnikuya: ****/¥¥ Ebisu. Gina is a walking map of Ebisu, it took us a long time to decide on a place with all the options that she kept pointing out to us while strolling around. Ebisu is also where the headquarters of Sapporo beer is...(you'd think it'd be in Sappora City). Anyway, this is the original Garlic Restaurant. Everything here is made with Garlic, which was interesting, tasty, but not one that I would return to. Not because I disliked anything (in fact, they had a REALLY HOT waiter) but just coz there's so many places I haven't tried and since I'll be leaving Japan in a few months, that doesn't give me a lot of time. But for anyone visiting here for a long period of time, this is a nice place to eat at least once. We all ordered garlic bread which was in a cylinder shape and garlic butter piled on top that you're suppose to poke into the cylinder with your chopsticks. We also had raw tuna covered in a thick layer of advocado and garlic. Garlic butter beef....and Yebisu beer, very tasty. I missed the taste of beer. Torafugu: ****/¥¥¥¥ Shibuya. Claire's tutee, Hide, was kind enough to treat the both of us to Fugu tonight. One of the most Japanesey experiences I've had, there was a huge 3D puffer fish hung high outside the restaurant (reminded me of the one in Osaka's Arcade area, but looked plastic with spikes all over it's belly, I know, I know, take a picture instead of writing 10,000 words describing it, but I'm not a camera person and I keep forgetting to take it with me, I'll go back with my digital camera). There was a fish tank full of puffer fishes at the window, I didn't know they were that huge, the size of a large catfish or a midsize carp. I love the way Japanese restaurants serve out set dinners. It's like going to a Chinese wedding, where you finish one course first then they bring out the next course. Before starting our meal, the waitress took a dried seaweed roll that was resting on the lid of the hot pot and threw it into the pot of water while turning on the gas burner. The meal started off with puffer fish skin cut so that they were shaped like long noodles. You dip it in this light sour soya sauce full of green onion. Then came deep fried fugu. I thought it tasted like chicken. There were still bones and you can eat this with your hands. Then came the huge plate full of stuff you put into the hotpot. You've got the customary cabbage and lettuce, glass noodles, shitake mushrooms, the long white mushrooms, tofu squares and the raw and freshly cut up fugu, so fresh that the nerves were still active, the mutilated fish with it's insides all exposed was still wiggling. After you heat the stuff in the boiling water for a few minutes, you take it out and put it in a small bowl full of that same light, sour, soya sauce. There were some sliced fugu without bones that you take with your chopstick and hold it in the boiling water for just under a minute, dip it in the bowl and eat. Everything else you allow to just sit in the boiling water until you want to eat it. For some reason, spring daisies are added later. By the end of that, you're quite full but there's more. Soon the waitress brought a bento full of Japanese rice, a bowl with raw eggs and some other seasoning. She empties the rice into the boiling water (by this time most of the hot pot stuff is gone) then scrambles the egg mix and pours it into the pot. The end result, reminded me of congee, but it's called ojiya, it's pretty thick, spoon it into new empty bowls, pour a bit of that soya sauce mix plus salt, and voila. You can't eat this anywhere else coz you need the fugu soup base made from the hot pot. Throughout this meal, Hide also ordered each of us hot sake with hire, (pronounced hee-reh), fried fugu fins that give the sake an extra umf of flavour and smell. I love hot sake. The waitress lit the sake and hire on fire first, covered it with a lid and served it in one of those sake holders I got you guys for Christmas. Finally, the meal ended with some kind of sherbet. Even Hide didn't know what it was but we're guessing apples were involved. Golten: Jiyuugaoka. Today tried the sweet and vinegar fish dish, the korean noodle dish, nabe (hot pot) and the chicken wrapped in some leaf. Found even more fav dishes! I LOVED the fish! The chicken wraps were not that good this time. Dai Buttsu: ***/¥¥ Shibuya. Since Jeffrey and Maggie came to visit me, I wanted to show them nouveau Tokyo which means they definitely have to try an Izakaya. This particular one can fit 1000 people and just opened up three years ago (info from secretary at work, Mitsuko). Actually, this is the same chain as the one in Osaka that Ken took us to. I ordered the mystery dish, an omelet with some unknown thing in the middle....I think it was raw eggs. The salmon wrapped in rice paper turned out to be EXTREMELY small rolls. I forgot to order the shrimps on crackers that were really good in Osaka. Ordered ground beef on boiled water wrapped in lettuce, the luxurious sushi rolls with four different sauces for you to dip in, the curry rolls which turned out to be normal bread rolled around curry then toasted, hmm different. Thai fried shrimp....etc...many dishes to experiement with. BTW, I have decided to NEVER order drinks (unless it's wine) to accompany my food coz they cost just as much as a dish, comes packed with ice, and basically not worth its cost. I'd rather spend the $6 - $12 on one or two yummy dishes instead of 100 ml of juice/tea/coke and a glass full of ice. Jeffrey ragged on me for not giving him this tip before he ordered hot tea, futatsu (two of em). Vidrio: **/¥¥ Shibuya. Suddenly addicted to Spanish Food, I couldn't stop myself from pulling Hinnie into this Spanish Restaurant with me in Shibuya. They listed exactly the same dishes as the ones I tried from Meson Madrid but we ended up just ordering the Paella del Mar which turned out to be a disappointment even though it was slightly cheaper. A smaller sized portion, it was too dry from being overcooked. Instead of chicken, they had squid and mussels, other than that, the two dishes had the same ingredients. Besides being overcooked (and the shrimps weren't deveined), the peppers were cut into tiny 1 cm cubes while at Meson Madrid, they had it sliced lengthwise which helped to add moisture to their dish. Even though my favourite Spanish dish turned out to be below par, the champiliores a la segoviana looked a lot more appetizing, partly coz they used larger mushrooms in a larger plate. The cost was slightly higher for this tapas. Meson Madrid: ****/¥¥¥ (Higashi-Nakano) I think aside from Thai and Indian food, my next favourite ethnic dish has now changed to Spanish food from Japanese Sushi. It's as flavourful as Thai and Indian but with a certain tanginess. Meg and I tried this small restaurant after reading a recommendation from Metropolis. Finding it was difficult since unlike the map in the magazine, the restaurant wasn't on the main road, we missed the big yellow sign the first time coz it was written all in Japanese (katagana) and pointed into a mall curvy street, after which you come to a fork with three different directions. Meg's intuitiveness correctly guessed the middle road and we found ourselves going down a short flight of steps and entering a small restaurant with the typical counter type seating where you can watch the chefs prepare your dinner. We chose to sit in the back with a six-seater table all to ourselves. The restaurant, for a Friday night was quite empty. In total 8 patrons including Meg and I, and we were there for a good 2.5 hours. We mainly ordered the recommended dishes from Metropolis: champiliores a la segoviana, tiny button mushrooms fried in garlic and onion with red chili and diced ham in a small dish. nothing special here and since I'm use to larger mushrooms, this dish was sort of disappointing but I still kept an open mind. next came the Ensalada de pimentos asados, red peppers roasted in olive oil, then peeled and chopped into thin strips, soft, moist and flavourful, crisp lettuce, cherry tomatoes, green beans and flaked juicy tuna meat that made this dish extra tasty and hearty. It's the same cost as the mushroom dish but it came in a large plate, which cheered up my growling stomach. Now we must have waited another 30 minutes after the salad for my favourite dish of all (surprisingly not mentioned in the article) the paella meson madrid (spelling might be wrong) but it's a seafood rice dish seasoned with saffron (that turns the rice yellow). There must have been hundreds of ingredients but the ones I recognized were mini clams, succulent prawns, tender chicken meat, and who knows what else. After squeezing lemon juice all over the plate, Meg and I devoured this dish. I ordered it only because I remember Debbie introducing me to Spanish rice when I went over for dinner once. Not to say Ame's sister couldn't cook (it was good) but this dish was soooooo flavourful I'm itching to come back for more. Both Meg and I ordered a glass of Sangria each to wash down the food and the wine really does add to the meal. And because I couldn't resist after seeing the couple beside us order this tasty pie, I ordered the tortilla espanola just to spoon two bites and asked to take the rest home. It's just a simple pie made from onion, potato and garlic covered in egg. I'm sure it would make a filling breakfast for my day trip into Kamakura with Claire tomorrow. Tried Monja in Motosumiyoshi. ***/¥ This dish is usually served in the same restaurants where one finds Okonomiyaki. Like its sister plate, it's a mixture of vegetables, I think cabbage, with flour and whatever other ingredients you order with it (ie. corn, pork, chicken, fish eggs, etc.) but the main difference is that in place of eggs, the mixture has a water base plus mochi squares (mooshed up gooyie rice, I'm sure most of you have tried mochi icecream). The result is a liquidy texture that can run all over the place unless you control it by making a donut shape out of the harder ingredients (cabbage and mochi). In the middle, you pour the rest of the mixture and wait for the floury-liquid to slowly cook and harden. Meanwhile, you are given this tiny flat spoon that resembles a shovel to slowly cut at the "donut" smooshing that small portion onto the cooking plate so that it sticks onto the "shovel". Then you blow on it to cool it down and eat the monja this way bite by bite. I would not recommend this dish if you're hungry. Just found out from Yukiko (one of the students I tutor) that my Language Exchange partner (Miho) didn't cook the monja properly (which makes the dish less disappointing). You're suppose to cook the cabbage first (with whatever vegies) until soft, then form a donut shape, pour a bit of the water/flour batter around the donut to make it stick and the rest of the batter in the middle with the fish eggs and mochi. So, must try again! Okonomiyaki is much yummier but also a lot more fattening. Besides the eggs, you add mayonnaise and okonomiyaki sauce that tastes like some kind of bbq sauce with dried fish skin and seaweed. The whole mixture is also given to you in a big bowl but this one's much more fun coz you get to mix it up thoroughly first, then pouring the whole thing onto the hotplate. You are given two large "shovels" to press on the okonomiyaki and if you time it right, you should be able to flip the whole thing over to cook the other side. I've only had this dish three times since coming to Japan. I also tried Isobeyaki, deep fried fish cake and some sliced up potato with butter and corn. After coming here, I think I have to say modern Japan likes to definitely experiment with food. They can come up with ingenious stuff like Takoyaki or fishegg pasta or pretty simple stuff like the potato and butter or rice with green tea and seaweed flakes. I should find out the name to these dishes. For dinner, I went to Golten (Asian fusion restaurant) with Brian and tried cold tofu with Korean sauce, Chicken and Vegetables in hot pot with Korean sauce, Korean noodles with vegetables (I just noticed the Korean theme) and Chicken wrapped in leaves. Really filling and yummy. Yesterday went to eat at conveyor belt sushi by myself. Made myself take the most disgusting dish floating out there, which I have a picture of, and ate it. To my surprise, it was actually one of the best sushi I've tried. I think they were mini squids.